Beginning in 2006, Uzbekistan was designated a “Country of Particular Concern” (CPC) for religious freedom by the State Department. However, starting in 2016, Uzbekistan’s leaders have ushered in unprecedented political, social, and economic reforms which have attracted worldwide attention. In July 2018, an official Uzbek delegation visited Washington, DC, to attend the State Department's first-ever Ministerial to Advance Religious Freedom. 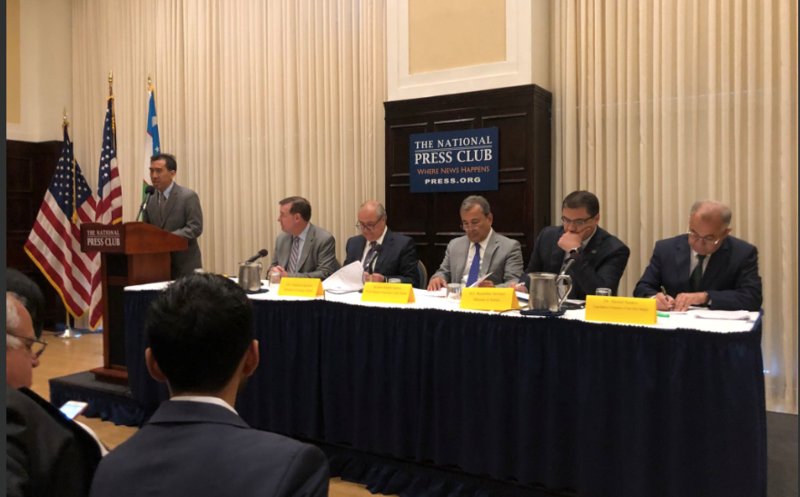 IGE and the Uzbekistan embassy co-hosted a panel presentation at the National Press Club where Uzbek cabinet ministers and parliament leaders announced major initiatives to reform legislation and government policies to improve religious freedom in the country. In September 2018, IGE led a delegation of U.S. Muslim and Christian religious leaders, scholars, and civil society representatives to Uzbekistan to meet with government officials, academics, and religious leaders. During the visit. IGE signed a Memorandum of Understanding (MOU) with the Uzbekistan president's think tank and a local NGO to partner on research, conferences, workshops, and delegation visits to build religious freedom in the country. IGE is committed to walking alongside partners in Uzbekistan to deepen and broaden this progress. In December 2018, the State Department removed Uzbekistan from the CPC list in recognition of the "substantial changes" that have been made. Once again, IGE and the Uzbekistan embassy co-hosted a panel discussion at the National Press Club, "Uzbekistan: An Emerging Model for the Muslim World—Marking Uzbekistan’s Progress in Advancing Religious Freedom.” IGE looks forward to walking alongside the government and people of Uzbekistan to further build upon this encouraging progress. 25 July, 2018: IGE executive director James Chen announced that IGE and the Uzbek government would be signing a Memorandum of Understanding (MOU) to partner on research, conferences, workshops, and delegation visits to build religious freedom in the country. 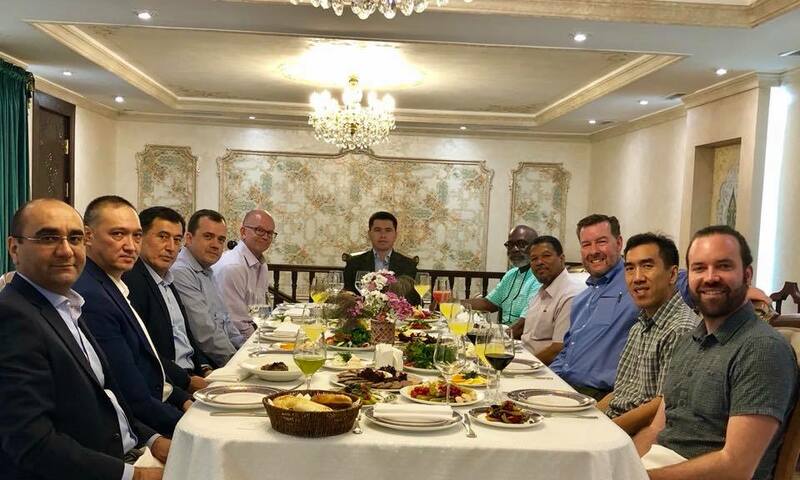 IGE delegation hosted for dinner in Tashkent by Ambassador Vladimir Norov, Director of the President of Uzbekistan’s Institute for Strategic & Regional Studies (ISRS) in advance of MOU signing. September 17, 2018: IGE signs a Memorandum of Understanding with the President of Uzbekistan’s Institute for Strategic and Regional Studies. The ceremony was attended by US Ambassador for International Religious Freedom, Sam Brownback, and US Ambassador to Uzbekistan, Pamela Spratlen. U.S. 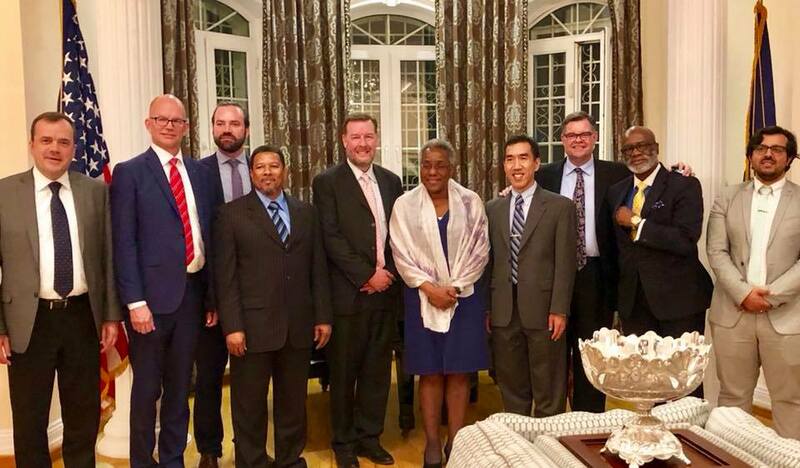 Ambassador to Uzbekistan, Pamela Spratlen hosts the IGE delegation for a dinner discussion of US-Uzbekistan relations and how religious freedom might be advanced thoughtfully, respectfully and for the good of both countries. 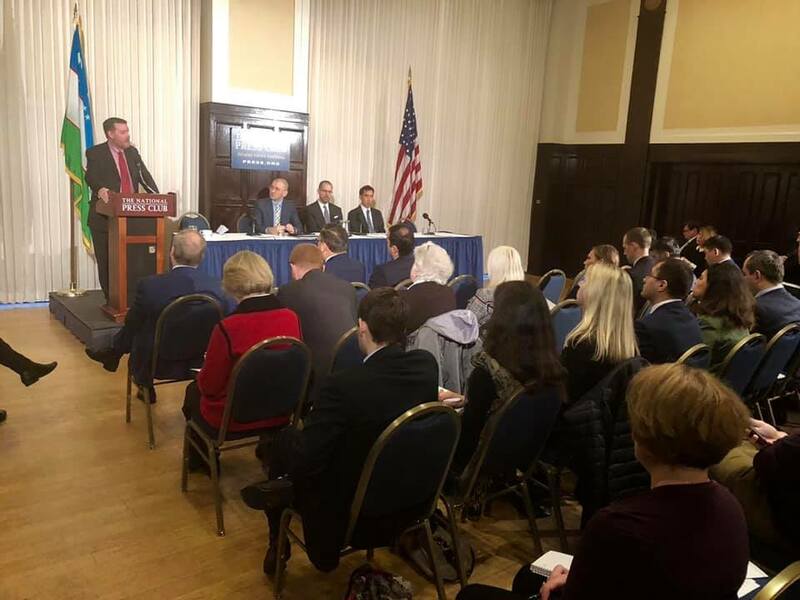 20 Dec, 2018: Following the removal of Uzbekistan from the "CPC" list, the Embassy of the Republic of Uzbekistan and the Institute for Global Engagement co-sponsored a keynote and panel discussion on Uzbekistan and religious freedom at the National Press Club. 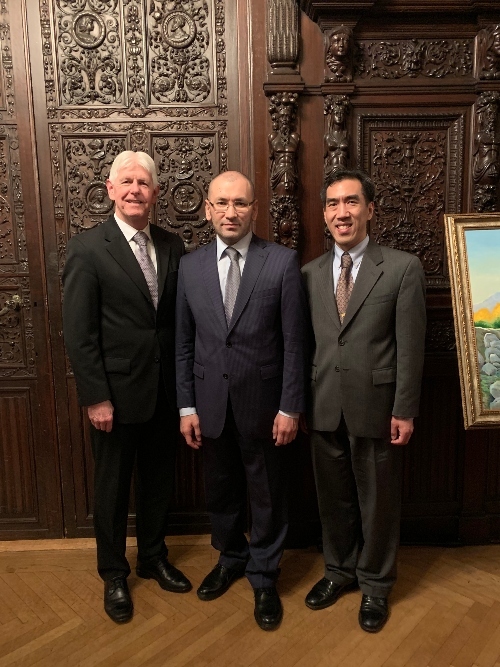 6 Feb, 2019: Honored to be guests of the Embassy of Uzbekistan to celebrate the formation of the first-ever Congressional Uzbekistan Caucus, chaired by Congressmen Trent Kelly (MI) and Vicente Gonzalez (TX). Thank you to Ambassador Javlon Vakhobov for his invitation to take part in this historic event! On December 11, the State Department announced the list of countries that exhibit the worst violations of religious freedom, designated as “Countries of Particular Concern (CPC).” Uzbekistan, which was placed on the list in 2006, came off of the list in recognition of the "substantial changes" that have been made. 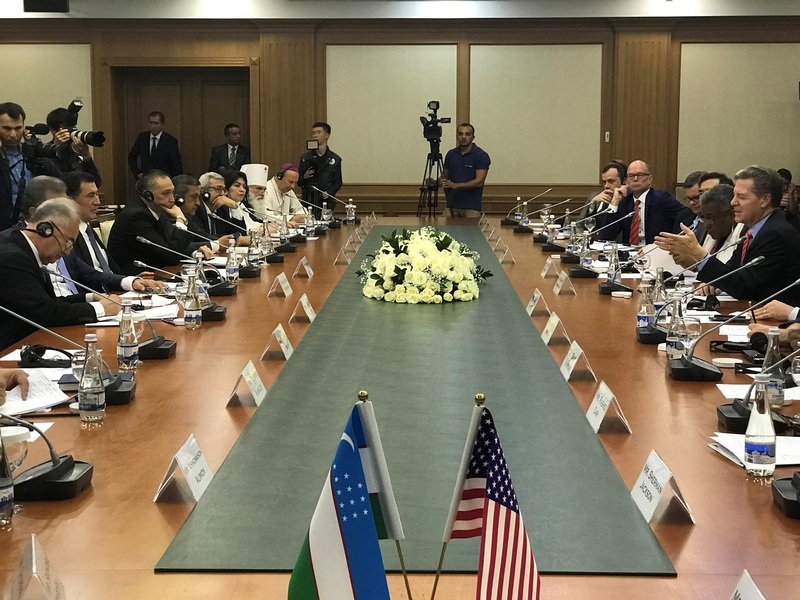 A few months prior in September, IGE led a delegation of Christian and Muslim leaders to Uzbekistan to learn more about the situation on the ground and sign a MOU with the Uzbek government to jointly work on projects to advance religious freedom. On December 20, the Embassy of the Republic of Uzbekistan and the Institute for Global Engagement co-sponsored a keynote and panel discussion on Uzbekistan and religious freedom at the National Press Club. IGE looks forward to walking alongside the government and people of Uzbekistan to further build upon this encouraging progress. IGE Executive Director takes a couple moments to share what a momentous occasion IGE was honored to take part in during September 2018. Worldwide, news regarding religious freedom is often quite grim; Uzbekistan, however, is a country demonstrating their desire for change. IGE signed an agreement to work in Uzbekistan on trainings, research, and study tours to help catalyze freedom of faith! Exciting times to come! Listen in and learn more! For additional videos of IGE's work, see our Facebook page. On July 25, 2018, the Institute for Global Engagement (IGE) and the Embassy of Uzbekistan co-hosted a groundbreaking panel discussion at the National Press Club in Washington, DC, on the Uzbek government’s new commitment to religious freedom. IGE is committed to walking alongside partners in Uzbekistan to deepen and broaden this progress.